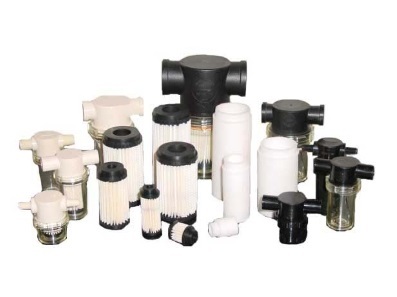 Inline filters are popular in many settings as they are an economic option for essential filtration and are effective with regards to both money and space. While often times these are a standard feature of air filtration systems, inline filters may easily be added into pre-existing airflow systems if a need for further filtration is determined. Common appliances such as vacuum cleaners and personal ventilation systems, as well as air powered tools such as spray and nail guns use air cleaner filters to create a healthier air environment. Pharmaceutical and chemical applications and preparation systems may also use inline filters with HEPA filter certifications or ULPA filters to maintain a consistent air quality. These uses necessitate that inline filters be relatively compact in order to fit in the space permitted as existing systems often using minimal tubing or piping sizes. However, inline filters must still be versatile as ventilation systems inherently vary. Many companies offer universal adapters for just this reason. 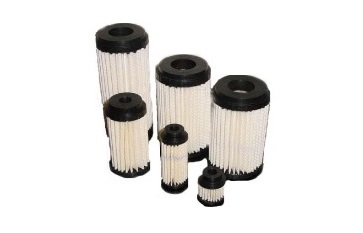 Typically, inline filters are placed near the intake valve of a system and before the expansion valves in order to ensure that heavy particles and potentially damaging water vapors are trapped before entering the essential components of the machine. The general scheme of the inline filter is as follows. A capsule-like cylinder is attached, with secure and airtight seals, to the midsection of pre-existing airflow components such as ductwork or tubes. Air flows through the initial tubing or ductwork and into the capsule. Within the capsule there are two chambers separated by a filtration device. Air is drawn through the filter while contaminants and vapors become trapped. Filtered air then continues through the second portion of tubing or ductwork and into the desired equipment. Ensuring that only clean dry air is passed through protects the equipment and its components improving its useful life and product performance. The materials chosen for filter panels within the inline filter depend upon the level of filtration desired. Common materials include acrylic, aluminum wire screen, electrostatic fabric, fiberglass, paper, polyester, cotton or any combination. Each of these materials allows air, but not particulates to pass into the machine. The construction of the capsule depends largely on the fabrication of the pre-existing airflow system. Inline Filter Inline or line filters are devices that attach to pre-existing ductwork or tubing to remove impurities and liquids from air streams in different systems such as transportation engine filtration, HVAC systems and air compressors. The inline filters are inserted into the systems to protect the receiving equipment from contamination by debris, particles and unwanted materials in the air stream.